SEATTLE, Wash. (September 13, 2011) – Rockwell Collins today unveiled its new ultra-thin overhead in-flight entertainment (IFE) monitors for regional jets. The announcement was made at the 2011 Airline Passenger Experience Association (APEX) Expo in Seattle. 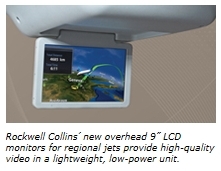 Rockwell Collins’ new overhead 9” LCD monitors for regional jets provide high-quality video in a lightweight, low-power unit. The retractable monitor can be mounted directly to the overhead storage bin without reconfiguration, making for easy installation. When coupled with Rockwell Collins dPAVES™ IFE system, regional jet operators can provide passengers with high-quality digital entertainment, prerecorded announcements and the industry’s premium Airshow 3D moving map, all while reducing weight, volume and power consumption. Rockwell Collins’ new overhead IFE LCD monitors for regional jets will be available in early 2012.